Is there a more scenic vineyard region in the world than the Douro Valley? In the north of Portugal, the deep valley carved by the River Douro and its tributaries snakes through slate-covered hills, with seemingly endless sunshine glistening on the slow-moving water. All around is silence. These hills are so steep that only by carving terraces can vines be planted, so the whole area appears like a giant contour map, with multi-directional rows of vines delineating every twist, turn and change of elevation. It is a unique and breathtakingly beautiful place to make wine. It is also a tough and demanding place to practice viticulture. Baking hot in the summer when temperatures regularly hit 40ºC, it is also remote, and those hills make for back-breaking work for the grape pickers in a land where mechanisation is almost unknown. But all that effort is worth it – and is the secret – of why the Douro produces one of the world’s great wines: Port. A fortified wine, Port is made by adding brandy to fermenting grape must, so it is strong at around 20% alcohol by volume, and sweet with all of that unfermented sugar left behind. Almost immortal, Port has been a UK favourite for centuries. Whilst for many it remains the king of fortified wines, it is a king whose dominion is under threat. Changing times and changing fashions mean that the Port-drinking population is ageing and dwindling. That picture is being repeated in many of Port’s traditional markets, though there are new opportunities in emerging markets, its former overseas territory Angola, and in Portuguese-speaking Brazil. Though there is a concerted effort to protect and expand the market for Port, Douro producers have added a second string to their bow over the past couple of decades: high quality table wines. 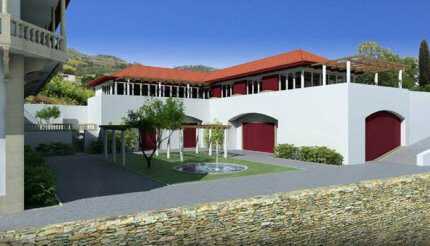 The region has traditionally produced more grapes than it could use for the prodution of Port because of a system known as the beneficio. Overseen by the Port Wine Institute, the beneficio attempts to always balances production of Port against vintage conditions, volumes being sold in the market, and stock-levels being maintained by the Port houses. Every year, winegrowers are issued with their beneficio, which stipulates how much of their crop can be used to make Port. The rest of the Douro’s grape production has historically been sold off in bulk, or made into cheap table wine for local consumption. Grapes with the beneficio could command significantly higher prices, and so tended to be of better quality. But as Douro producers realised that quality table wines were possible, that ‘surplus’ fruit became more valuable and its quality increased. As both established Port houses and new initiatives seized this opportunity, a quality table wine industry in the Douro was born. There was one significant forerunner, a wine named ‘Barca Velha’ first produced in the 1950s, but it was not until the 1990s that wines like Niepoort’s ‘Redoma’ heralded an explosion of interest in the Douro as producer of world class table wine. Over 20 years of regular trips to the region I have seen no sign of a slow down in the development of the table wine industry. I have just returned from a few days visiting some of the producers making both table wines and Ports, to see how the New Douro is shaping up. The Symington family are synonymous with the Port wine trade. It is currently the thirteenth generation that is in charge of a business that is responsible for more than one third of the entire world trade of premium Ports through their Graham’s, Warre’s, Cockburn’s, Smith & Woodhouse and Dow’s brands. I travelled from an excellent lunch in Taylor’s visitor facility in Villa Nova de Gaia to spend the night at Quinta do Bomfim, one of Symington’s main facilities, sited in the town of Pinhão. Here, one of the Symington winemakers, Henry Shotton (right), met me for a tour of the vineyards before a tasting that spanned the family’s estates. Henry led me to a point in the vineyards where the three planting systems commonly found in the Douro could be easily observed: the traditional terraces, dug by hand and created by building beautiful dry-stone walls to retain them, the patamares, a new type of terrace often blasted from the hillside, much broader than the traditional style, but with no retaining wall, and finally ‘vertical planting’, used only on the most gentle slopes, where vines can be planted without terracing. 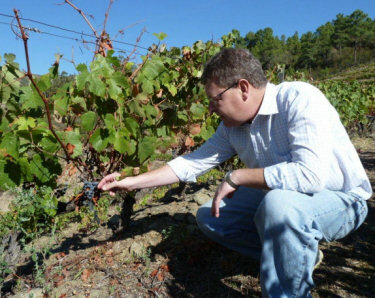 Whilst many of Symington’s vineyards are ‘old vines’, meaning they are field blends of dozens of different varieties planted together, newer plantings tend to be in varietal blocks on these clay and slate soils, recently these have included Alicante Bouschet and Sousão, as well as the main grapes of the Douro, which are Tinta Roriz, Tinta Barroca, Tinta Cão, Touriga Franca and Touriga Nacional. But Symington have also embraced table wines, from their ‘Altano’ brand, which can be bought for under £10 per bottle and is in wide distribution, up to Chryseia, produced in a joint venture with Bruno Prats of Bordeaux, and one of the Douro’s new breed of expensive ‘icon’ wines. Lavadores de Feitoria is a fascinating project, led by highly experienced winemaker Paulo Ruão (right) who met us at their unique winery, based in one of the Douro’s main tourist attractions, the famous Casa de Mateus, the grand baroque palace built for the 3rd Morgado of Mateus in the early 18th century, and featured on the label of the iconic Mateus Rosé wine. About two kilometres from the town of Vila Real, the palace itself is well worth a visit for a tour of the interior and magnificent formal gardens (below). Lavadores de Feitoria produces only table wine. It is not exactly a cooperative, but an association of investors and producers, so very much a business, taking grapes from quintas across the region. Its inception in 2000 was inspired directly by the new breed of Douro table wines, and a response to utilising high quality grapes that could not be used for Port because of the beneficio. Paulo, who joined in 2005 from Ramos Pinto, explained that Lavadores de Feitoria has 10-year contracts with each supplier. It is obviously a very successful model “We now have 20 members, but a list of 20 more wishing to join,” he tells me. In fact they have 33 shareholders, but 20 who have vineyards and supply the project. 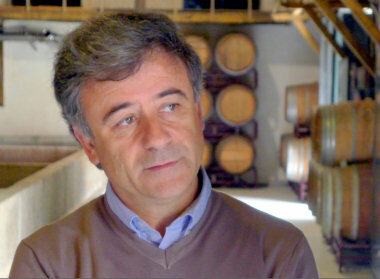 Their president is the current count of Mateus, hence their unique location, though there is another modern winery too. At the historic winery in Mateus, vinification begins in ancient granite lagares, where the best grapes from old vines are foot-trodden. Paulo says “The objective of the company is to produce something different, so we have varietals and blends, and as well as more traditional varieties we bottle Riesling and Sauvignon Blanc. We are trying to show that many things are possible in the Douro.” Indeed one of the Lavadores wines made it into my “50 Great Portuguese Wines” when I was Portuguese Wine Journalist of the Year in 2011: the highly unusual ‘Meruge’, grown on the coolest, north-facing slopes, and a very different take on the Douro with its low alcohol and open, soft, almost Burgundian sensibility. 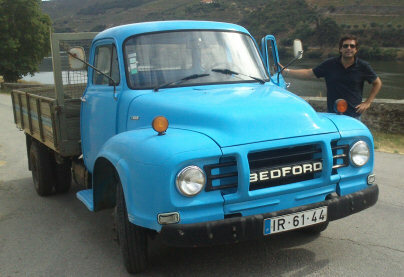 Arriving at Quinta do Crasto by train (it has its own tiny station on the line that hugs the Douro as it passes through the vineyards) I was delighted to take a bumpy ride up the steep slopes in Crasto’s lovely 1950s Bedford truck (below). That was a surprising beginning to a visit to one of the Douro’s most forward-thinking properties. Crasto takes its name from ‘castrum’, a Roman fort, as one was sited on the location of the quinta, a glorious promontory that juts out over a bend in the river. Winemaker here is Manuel Lobo de Vasconcellos (right), with whom I also had the pleasure of judging at the Portuguese Wine Challenge in Lisbon just a couple of weeks after my visit. Manuel pointed out new white wine planting right at the top of the property at 550 metres, where they are currently drilling 150 metre bore holes to find water. “We are planting where slate and granite merges,” he tells me, the altitude and the granite being keys to freshness in Douro whites. Crasto is large, with 150 hectares here in the Cima Corgo, 114 more in the Douro Superior, and controlling other vineyards to give a total of 300 ha. Though not farmed organically, vineyards are sewn with wild grasses to give the vines more competition, control weeds and add nitrogen to the soils, as well as guarding against erosion. 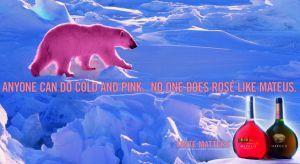 No herbicides are used and chemical treatments are minimal. There are more crucial decisions and challenges in the winery too – especially choices on pressing and extraction. All fruit is sorted on tables, and there are cement lagares with robotic treading as well as traditional foot treading for the first four hours. Only natural yeasts are used, “and the body heat of foot traders helps start fermentation,” quips Manuel. 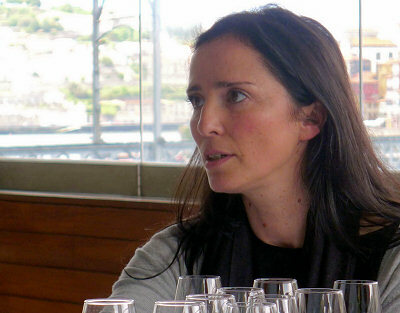 Whilst Crasto does make some Port wines, its reputation has been built on modern Douro table wines, and that was the focus of my tasting. Having visited two houses essentially focused on table wines, my last stop on this short tour was back in Porto, and the cellars of Sogevinus. Sogevinus is a fascinating company. It grew from a business begun in 1998, when the Galician banking group Caixanova bought a significant share in a Port and wine producing company in partnership with the long-established Port house of Cálem. Over ensuing years, Cálem’s fortunes waned, and by 2003 Caixanova had taken on 100% of the company. It began significant investment, not only in Cálem’s vineyards and properties, but by acquiring other Port houses including Kopke, Burmester and Barros. 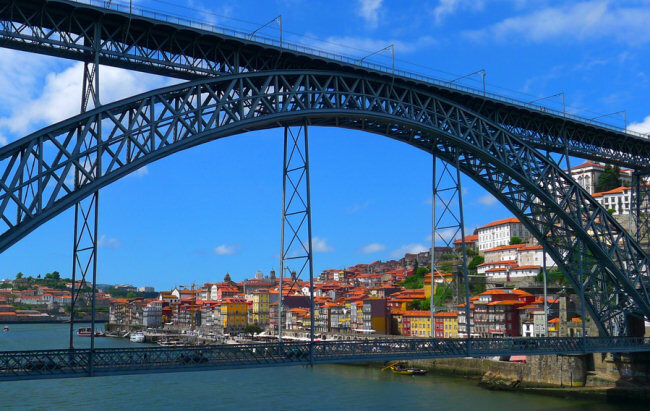 Focused today on both Port and Douro table wines, the company has a hugely busy HQ just across Porto’s famous Eiffel bridge in Villa Nova de Gaia, which sees 270,000 visitors per year. 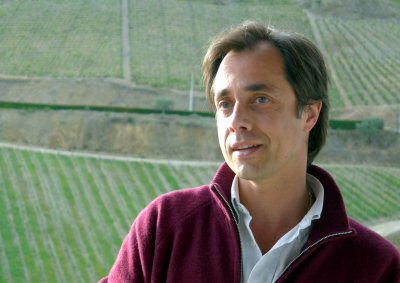 They have acquired breathtaking stocks of old Ports, especially some exquisite old Colheitas – vintage-dated tawny wines. Below: the view from Sogevinus in Gaia. Winemaker Carla Tiago (right) met me, along with old friend Tânia Oliveira, Director of PR and Communication who once did a similar job for Wines of Portugal. We also met M.D. Gonzalo Pedrosa, whom Caixanova brought into the company from the car industry, one of whose main aims has been to streamline the processes of the merged companies. He is finding huge efficiency savings in areas like logistics and administration, whilst leaving the winemakers to their own devices. Historically the Sogevinus brands have not had nearly the same presence in the UK market as those houses with British connections like Symington and Taylor’s, but that is set to change and Tânia told me that the UK is one market where she sees huge potential for those fabulous old tawnies as well as their other Ports and table wines. The company really does see itself as guardians of an incredible legacy, with houses like Kopke (formed in 1683) and Burmester (formed in 1730) and their acquisition of extraordinary stocks of aged – and ancient – wines. All of the wines I tasted on this visit – only back to a relatively youthful 1952 Burmester – were breathtakingly good. One of the companies policies is to bottle these wines from cask just as they are needed for the market, so look out for 1965s appearing on the shelves, perfect for those with 50th birthday or anniversary celebrations. The company also has an extensive range of table wines, some of which I tasted on a return visit to Portugal and which will form part of a future report. for tasting notes on 12 wines from Sogevinus.